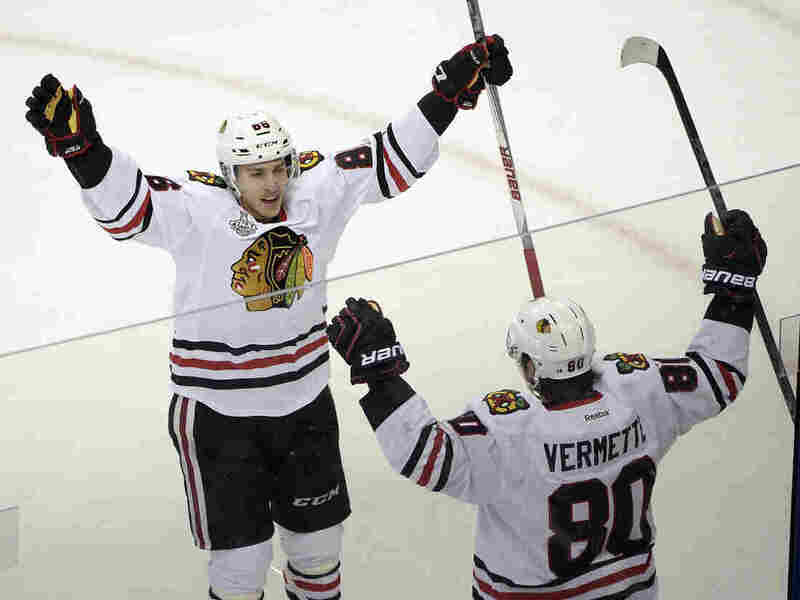 Stanley Cup: Chicago Scores Twice In Final Minutes To Defeat Tampa Bay : The Two-Way The Chicago Blackhawks defeated the Tampa Bay Lightning 2-1 in the opening game of the National Hockey League best-of-seven final. The second game is Saturday night in Tampa Bay. Chicago Blackhawks center Antoine Vermette (80) of Canada, celebrates his game-winning goal with Teuvo Teravainen of Finland (86), against the Tampa Bay Lightning during the third period in Game 1 of the NHL hockey Stanley Cup Final on Wednesday in Tampa, Fla. The Stanley Cup final, pro hockey's championship series (for those who don't closely follow winter sports, and wait — it's June!) got underway last night in Tampa, Fla. The Chicago Blackhawks, one of the NHL's original six teams, defeated the Tampa Bay Lightning, one of the Sun Belt expansion teams formed in the 1990s, 2-1. Chicago is skating after its third Stanley Cup since 2010. Tampa Bay is going after its second championship. "... the Hawks struck at 13:28 to stun the crowd of 19,204. First, [Teuvo] Teravainen sent a shot from the left circle that sailed past a screened [Tampa Bay goalie Ben] Bishop. [Antoine] Vermette then gave the Hawks a 2-1 advantage when he wristed a shot from the slot. "Said winger Patrick Sharp: 'We certainly believe in ourselves in our locker room and we're never out of any game despite the score or how it looks out there. Two big goals at the end to get the win.' "
" 'We learned our lesson here.' "
"Both the Blackhawks and the Lightning are fast-skating, high-scoring teams with rock-solid goaltending... and despite their wide open styles, both teams can clamp down defensively to limit opponents' chances. Both teams went to the seven game limit in their Conference finals; Chicago beating the much bigger, more physical Anaheim Ducks; while Tampa knocked off the much bigger, more physical New York Rangers. The Blackhawks are led by the dynamic duo of Patrick Kane and Jonathan Toews, and are trying to build a dynasty in going after their third Stanley Cup championship since 2010. The Lightning, led by superstar Captain Steven Stamkos, last won the Cup in 2004." The Tampa Bay Times has a preview of the series here. Or if you prefer the spin from Chicago, here's what the Tribune offers. And if you're looking for a neutral but incredibly detailed preview, maybe the sports site Grantland is the place to go.